The yttrium complex of 1,4,7,10-tetraazacyclododecane-1,4,7,10-tetra(1′-13C-acetic acid) [13C]DOTA was synthesized. 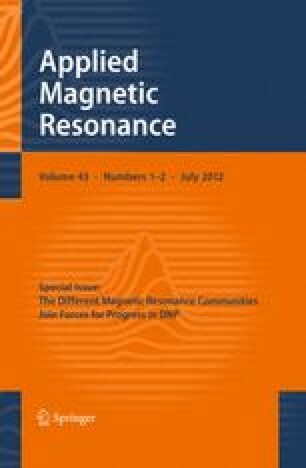 Fast dissolution dynamic nuclear polarization (DNP) nuclear magnetic resonance (NMR) studies revealed that the 89Y, 13C, and 15N nuclei present in the complex could be co-polarized at the same optimum microwave irradiation frequency. The liquid-state spin–lattice relaxation time T 1 of these nuclei were found to be reasonably long to preserve some or most of the DNP-enhanced polarization after dissolution. The hyperpolarized 13C and 89Y NMR signals were optimized in different glassing mixtures. The overall results are discussed in light of the thermal mixing model of DNP. We acknowledge the National Institutes of Health (grant no. R21EB009147) for the financial support on this work.